What it’s supposed to be: A murder mystery (or three), a societal farce, a slapstick comedy, and a twist on the classic noir movie. 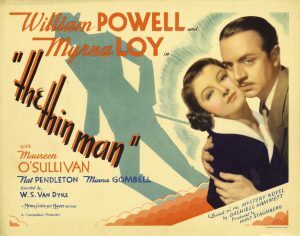 Why it’s a Christmas movie: Like so many movies on this list, The Thin Man takes place at Christmas time. Like so many movies on this list, the season is not what the movie is about, but the movie uses the season. The Christmas holiday sets part of the plot in motion. A Christmas party is central to getting the main characters into the plot but also reveals information about the characters. And the season itself gives the characters — Nick and Nora — something else of moan about. Thoughts: There’s a witty wink and nudge throughout this movie and more than once you almost expect the characters to look at the camera and wink. They don’t. They come close, but they don’t. The married couple at the center of the movie trade witticisms and drink martinis and you almost get the impression they are just looking for something, anything, to give them some meaning in life. But they have each other, and they’re true to each other. They search for meaning together. But if this is a Christmas movie, it’s of the Grinch variety. In fact, Nora says she’ll kill the next person who says “merry Christmas” at one point. The movie drips with style. The actors snap their lines back and forth. The noir elements are used to full effect, including a character who casts a long, metaphorical shadow that is shown on the screen as a literal shadow. And Nick and Nora seem to float through life until a crime engages them and suddenly they sober up. Is It Naughty or Nice? Oh, this movie is naughty. Absolutely. It’s subversive and clever and funny. But, that said, it’s good because it’s subversive and clever and funny.